There are five RIRs. 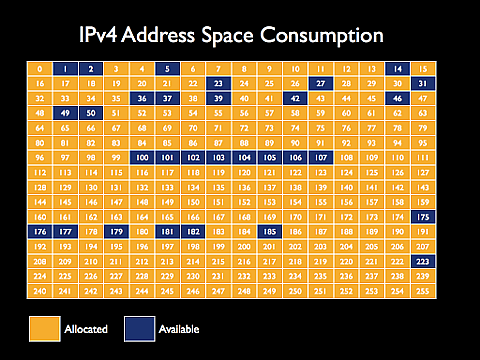 If you exclude the five reserved /8s, the IPv4 pool has only 25 /8s free, or 9.7%. That's a pretty sobering reality. The above image (taken from the RIPE NCC 2008 Annual Report) shows IPv6 initial allocations by the regional registries. The blue line is Europe, Middle East and parts of Asia. The green line is the US and Canada. The purple line is the Asia/Pacific region (including Australia). All three regions showed enormous growth in IPv6 allocations from 2007-2008. This is good news, since we'll need every year from now on to be a record year if we're going to get IPv6 deployed in any reasonable timeframe. It's interesting that Africa (the red line) and Latin America (the yellow line) didn't show any real growth. 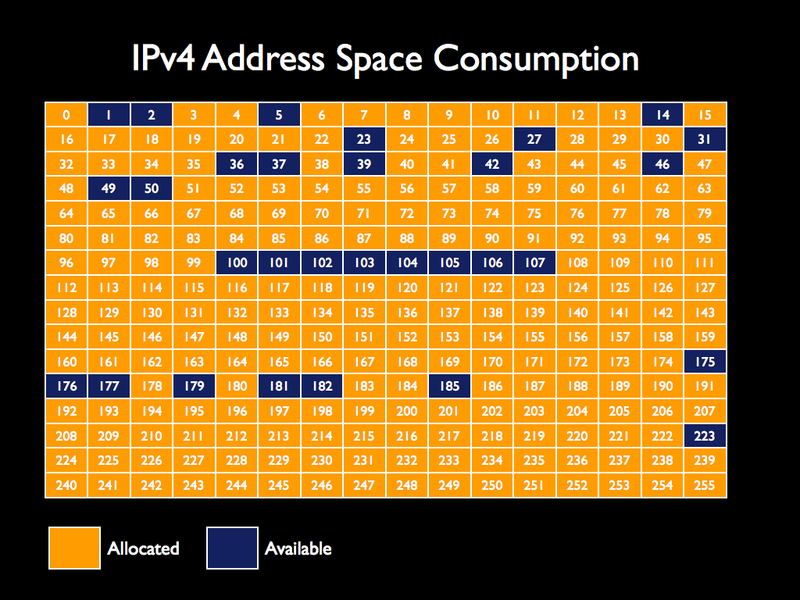 Those regions could be acutely affected by IPv4 depletion, as they have very few IPv4 addresses to begin with. Snort 2.8.4 was released today. There are several compelling reasons to upgrade. One of them is that 2.8.4 has much improved IPv6 support. Snort has had basic IPv6 support for a while, but 2.8.4 adds IPv6 support for Frag3 and the application preprocessors (SMTP, FTP/Telnet, DCE/RPC, SSL, DNS, Portscan). IDS support has been a stumbling block for IPv6 deployment, so I'm really glad to see this.